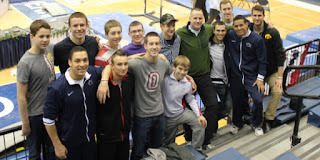 4-20-2013---Men's NCAA Gymnastic Championships- The Hocking Valley Boys team travelled to Penn state to support several Hocking Valley alumni. Pictured are Matt Chelberg, Drew Moling, Andrew Rickly, Cory McFann, Colin McDermott, Leo Genders, Connor McDermott, Trevor North, Michael Burns, Coach Mike Serra, Miguel Pineda, Preston Gall, Trevor Howard, Ben Ketelsen All of our HVGC guys did great! Drew made semi-finals on Rings and Preston was the first alternate for finals on PH. Trevor Howard (Big 10 Freshman of the Year), once again, stole the show and made event finals on 3 events and won Floor Exercise! To win the NCAA title as a freshman is very rare. Congrats to him and Penn State. April 13th Event Chocolate Walk 2013 Hocking Valley handed out chocolate gold medals to all who stopped by... nice to see old friends and meet new friends too!